A page on lighting inventors from the Smithsonian National Museum of American History. 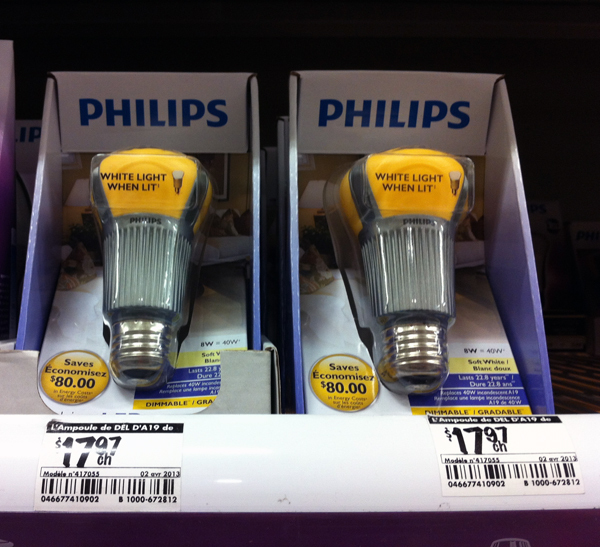 A Reuter’s piece on Canada’s (now delayed) roadmap for banning the bulb. A Canada Gazette article on the ban. Wired article about LED lighting, including Orad’s mention about the US ban. A wiki page on Edison. A Toronto Star article on the ban. A CBC story on the relationship between bulbs and heating bills. The US EPA’s Energy Star page on bulbs. A post at Treehugger about the L-Prize. This one has to do with scaling. Basically, a skeleton gets heavy faster than it gets sturdy. The weight of any structure, like a bone, is proportional to its volume. That’s the linear dimension cubed. Big bones mean heavy bones. Meanwhile the amount of weight a structure can support is related to pressures, which go like the force per cross-sectional area. That’s the linear dimension *squared*. So as bones get bigger, the weight they support goes up like the square of the length, but the weight they add grows even faster, like the cube! This means that if you scaled up any animal, you’d eventually reach a point where its bones weigh more than they can support, and its skeleton would collapse. That’s the upper limit. That also explains why sea animals can be larger than land animals– things weigh less in water. The whole thing works in reverse when you talk about very tiny animals. That’s why ants can carry so much weight without collapsing. Engineers have to take this into account when designing bridges; just because a scale model is sturdy doesn’t mean the real thing will be. This episode was researched, written, hosted and recorded by Orad Reshef and Jesse Corbeil. Sound editing was done by Jesse Corbeil and Aimee Gillespie. This entry was posted in Episode and tagged E&M, history, light, platinum, Thomas Edison by Jesse Corbeil. Bookmark the permalink. I really like the way that you talked about Edison being credited as the inventor of the lightbulb even though his work drew heavily on that of others, and what we think of as the modern lightbulb was inspired by his work, but not his work directly. It really drives home the message that inventors (and scientists, in their discoveries) are just pushing forward what came before them, and their own work will be pushed forward in turn. The decision about who gets credit for what in the history books sometimes feels a bit arbitrary, and that situation becomes only more problematic and interesting when you get into quantum mechanics: often, one person predicts an effect theoretically, but it won’t be observed until years later when the instruments have become sophisticated enough for a sighting. So who’s the discoverer? The person who saw it first, or the person who knew it was there to be seen? Hey Brooke, thanks for the reply! If I had to choose, I’d say if you had a solid theoretical prediction, you would be credited as the discoverer even if someone else eventually observed it in an experiment. As an experimentalist, you’d still get your credit, though – a classic example is of Eddington’s expeditions in the early 1900s that tested for relativity. That was a super famous experiment, any serious physicist can tell you all about it. However, we still call it Einstein’s relativity, and the headline in the New York Times the next day read “EINSTEIN THEORY TRIUMPHS” despite Einstein himself not doing anything.